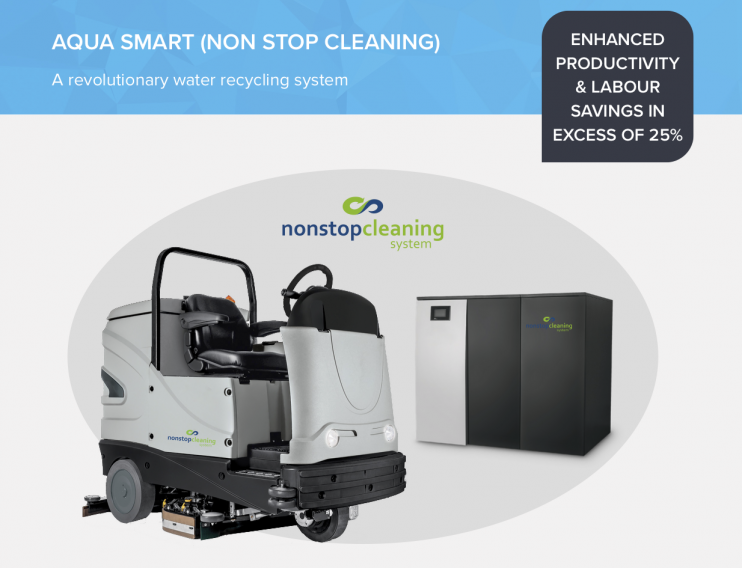 Aqua Smart - Non Stop Cleaning | Industrial Cleaning Equipment Ltd.
Finding ways in which we can reduce water consumption is of huge importance in the cleaning industry, especially given the vast amount of water used during even simple cleaning operations. The amount of fresh water available in the world is decreasing due to human activities and is therefore is a limited and vulnerable resource that we need to protect more than ever before. Thanks to the introduction of more and more innovative technologies, we are able to look at new ways of re-using water within the floor cleaning process, whilst ensuring that the quality of cleanliness is not impacted. This year we will be introducing Aqua Smart (non-stop cleaning) to our range – an innovative system which recycles and filters the water used to clean floors. The same water can be re-used for a week (based on 3-4 hours use per day), which not only dramatically reduces water consumption, but also saves the cleaning operator time as they don’t have to keep emptying and re-filling the machine. This water-saving system will be contained within the new ICE R Scrub 85 NSC machine, or alternatively will be available as a separate standalone unit which can be used with any type of scrubber dryer. This separate unit is essentially a washing machine for water! The dirty water from the scrubber dryer is loaded directly into the unit, and in just 30 minutes it can clean up to 150 litres of water. The dirt from the water is separated, collected in bags and dehydrated, making it easy to dispose of. Not only does this type of system benefit the environment, it also helps businesses to increase cleaning productivity and reduce wasted time. As no stops are needed to empty, clean and refill the machine, it is possible to save up to 25% of man hours in a year. Plus, this self-cleaning filtering system can result in savings of up to 90% on water costs associated with cleaning. For even greater water savings and efficiency, both the standalone unit and the cleaning machine that contains the water-saving tank can be used together. This is where the real impact lies as it results in a scrubber dryer that can use the same water for a week, alongside a treatment system that can clean the water for re-use over and over again.